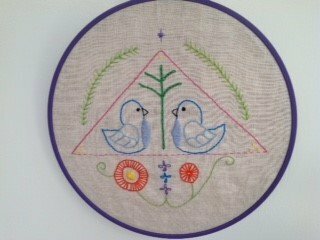 This is a 4 hour class that will teach you the basic stitches and how to get started on an embroidery project. Pattie will supply linen fabric with a pre-printed sampler pattern that will incorporate the basic stitches in the five stitch groups. We will also go over the supplies you will need and how to transfer a design onto fabric using a transfer pen, carbon paper or water soluble transfer paper. Then we will discuss how to care for your embroidery and how to frame and finish the sampler. There will be a lot of discussion on how to use the stitches you have learned and you will go home with a pretty sampler to hang on the wall.